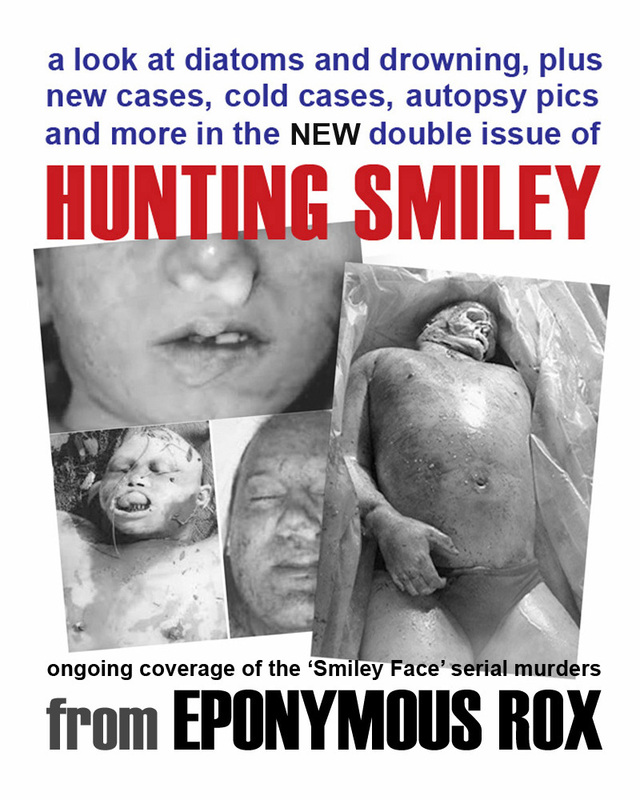 Sixteen years after Smiley Face Killers ‘Victim Zero’ Patrick McNeill was murdered in NYC and his corpse dumped into the East River, Nick Wilcox likewise vanished under suspicious circumstances from Milwaukee Wisconsin. 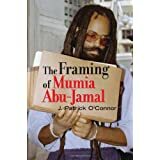 By then, the February 1997 McNeill case had long grown cold without an arrest, and hundreds of other young men all over the globe -- from every race and every walk of life -- had met a similar fate during the dead of winter. Today, the body count in The Case of the Drowning Men continues to climb, far surpassing that of any known serial kill spree in history. And yet not a single perpetrator has ever been prosecuted. 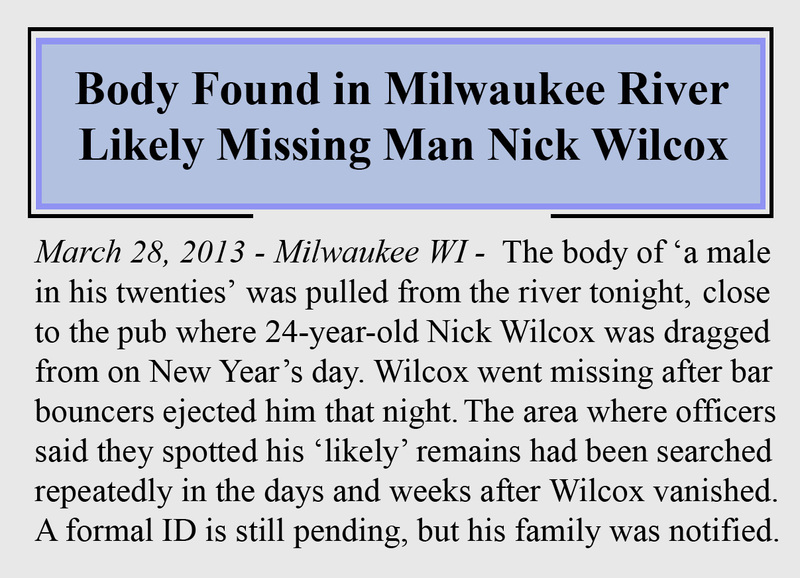 Here’s how 24-year-old Nicholas Wilcox “went missing” on New Year’s Eve 2013 and then “accidentally” died in the Milwaukee River. NICHOLAS WILCOX DISAPPEARS AND DIES: Three months after he was bounced from a New Year’s Eve celebration at a notorious pub in downtown Milwaukee and vanished in thin air, missing man Nick Wilcox was finally found. Drowned. Two patrolmen said they just happened to be casing the banks of the Milwaukee River late in March of 2013, when they spotted the young man’s corpse floating near the shoreline. It was badly decomposed and in an area of the waterfront that had been thoroughly searched before, multiple times. The 24-year-old political-science major, crowd-control trainee, and future educator “got separated” from his group of friends, after bar bouncers “removed” him from the Irish Rec Room on New Year’s day. Wilcox was reportedly ejected alongside two brawling male patrons who he didn’t personally know but had stepped in between. When more than an hour passed and she still couldn’t reach him by phone nor locate him anywhere outside, McGonagil prodded Irish Rec’s security detail for more information. They told her he had “left with a guy wearing a red shirt” and, because that description coincidentally matched someone in the Wilcox party, she didn’t realize until many days later that the bouncers weren’t telling the truth. By then Nick Wilcox was officially missing and both Irish Rec Room’s security team and its owners had considerably modified their account of what happened the night he was forcibly ejected from their premises. Sadly, this too was a lie. ABOUT THE IRISH REC ROOM: Two weeks before Wilcox and his friends paid $60+ apiece to ring in 2013 at the tavern on North Old World Third Street, the Milwaukee Common Council had decided to revoke its operating license. Citing “numerous” complaints about “disorderly conduct” plus other “deviations” and “disruptive behavior” at the Irish Rec Room, disgusted council members voted on December 18th not to renew its ‘Class B’ public entertainment permit. Without that authorization, the sprawling pub -- owned and operated at the time by Whiskey River Saloon Milwaukee LLC, and open for business only about a year -- was legally required to close its doors within 30 days of the Common Council’s decision. The city’s shutdown order was exceptional and an attorney for the WRSM Limited Liability Corporation bitterly characterized it in a news interview as "severe and excessive," stating that Irish Rec Room’s management had taken “many steps to improve” the tavern’s operations. But, as Nick Wilcox’s experience there would later illustrate, this claim also proved dubious. THE SEARCH FOR NICK WILCOX: Due to the Irish Rec Room’s inglorious reputation, at least one squad car was allegedly stationed near the entrance of the waterfront pub on New Year’s eve, in case any patrons got too rowdy. It isn’t unheard of for police to take such preventative measures, but, unfortunately, when Nick Wilcox was physically hauled outdoors that brutally cold night these officers “didn’t see” a thing. Thereafter, it only took a matter of minutes for the Wilcox family to see it wasn’t their blond-haired, blue-eyed, 6-foot tall, 180-pound young man. No images ever surfaced of the red-shirted friend (or fiend) who the bar bouncers told them had escorted Wilcox down the street the night he went missing. WALKING ON THIN ICE: In serious disrepute and becoming more tarnished every day that Wilcox’s vanishing act remained unsolved and unexplained, owners of the Irish Rec Room decided to shutter their establishment well in advance of the January 18th deadline. Done then with serving booze and burgers to a boisterous 20-something crowd that sometimes erupted into fisticuffs, they instead invited the dispirited Wilcox family to use the bar exclusively as their search headquarters. At this point in the effort to locate Wilcox, most everyone still considered it a rescue mission … until someone discovered a spot in the Milwaukee River where the ice appeared to be broken. Tactical divers were immediately assembled to probe the frigid waters, but, after a thorough inspection, and to the relief of his anxious relatives gathered at the shore, declared that Wilcox wasn't in there. On January 10th, however, a dive team once more was called to the riverbank, announcing several hours later that the body they pulled from the Milwaukee was "not that of Nick Wilcox." This victim, police said, appeared to be "a 50-year-old man" and was spied earlier that morning afloat in an area not far from where Wilcox had disappeared. An investigation into the older male’s drowning death revealed he was reported missing at around the same time, but had been suffering from chronic depression for years. “Very likely” he jumped and “committed suicide,” officials said. CHILLING THOUGHTS AND A JANUARY THAW: Toward the end of January 2013, with Nick Wilcox still missing and no clues as to his fate, it had begun to dawn on the hundreds looking for him on land to turn their attention to the river. A warm spell had descended on the region, bringing with it a mixed bag of rain, sleet and wet snow. As a result, the frozen Milwaukee was starting to thaw and congest with ice-flows again, and, after weeks of this unseasonable warmth, some things long settled on the riverbed were beginning to refloat. Yet still no sign of Nick Wilcox. ANOTHER SMILEY FACE MURDER IN WISCONSIN: Nick Wilcox’s home state of Wisconsin is considered a ‘Smiley Face Killers’ hotspot for missing young men showing up drowned after a night out with their friends or even while walking around sober but inattentive. So it’s no surprise that Milwaukee itself has been the scene of similar disappearances. Coroners and cops everywhere are quick to blame alcohol for the seemingly endless stream of missing males discovered doing the dead man’s float in their jurisdictions these past two decades, but by now even they know their explanations don’t hold water. Tom Hecht, for instance, was not exactly an “inexperienced youth” when he suddenly vanished from a downtown Milwaukee bar located only a short distance from his own apartment. 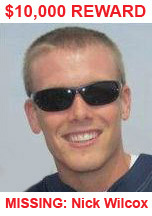 The 28-year-old Milwaukeean both lived and worked in the heart of the city, and was doing a pre Saint Patrick’s Day pub crawl there with his colleagues on the evening of March 10, 2012, when he inexplicably got separated from them. Hecht's friends said it was like one moment he was standing there at Rosie’s Bar on Water Street mingling and having a good time, and the next "he was gone." Immediately after this discovery, local news sources reported that “Milwaukee police would not comment on the timeline” anymore, nor on how the 45 minute discrepancy might affect their view and investigation of Hecht’s case. Quizzed once more about the odd discrepancy at a press conference held later that same week, a spokesman for the department indicated their drinking-and-drowning theory was nevertheless still in play, although harbor units had searched the waters and not found Hecht’s drowned body. "We're still walking the river's edge,” he told reporters. “We still have a boat on the river. We're continuing to interview friends who were last seen with Mr. Hecht." 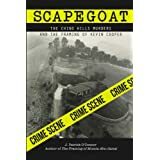 Hecht’s friends and family, however, were equally in the dark, and many of them had begun to openly speculate that "he may have gotten in a cab and he may have gone to Milwaukee’s Third Ward,” although “no one [was] certain" of this. Together they spent nearly two weeks canvassing all the downtown neighborhoods their missing man could have possibly walked or ridden to. 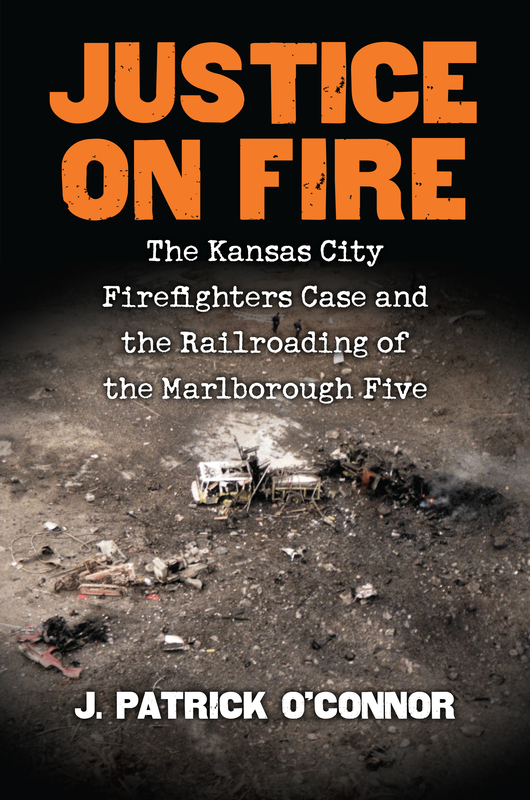 While firemen, police and the Coast Guard knowingly kept on probing the Milwaukee and its banks. Finally, on March 22, 2012, word came that a drowned male matching Hecht’s description had been spotted in the Milwaukee River. Officials informed members of the press who had hurriedly assembled at the recovery site that they believed the corpse was that of Thomas Hecht and “there were no signs of trauma” on it. Any enquiries as to why they didn’t find the drowned man sooner were deflected. Weeks later, the medical examiner reached the same conclusions, pointing to the BAC result of .22 as proof the victim drowned due to inebriation, despite it being common knowledge that dead bodies produce ethanol as they’re decaying and do so at accelerated rates when fully submerged. Per usual, no diatom tests were performed to determine whether Hecht was indeed alive when he entered the water, or placed there after death. IN THE DARK: According to the Center for Disease Control, the odds of anybody non-recreationally drowning any time of year, especially during winter, is nil. But in places where it occurs now with frightening frequency, such as Boston, New York, Philadelphia and Milwaukee, the police don’t seem to be concerned. They also never see any reason to either identify or interrogate the bouncers who are usually involved in drowned young men’s initial disappearances, and who, not uncommonly, are off duty or retired cops themselves. Thus was the situation with the whitewashed missing persons case and cold-weather drowning death of 24-year-old Nick Wilcox. 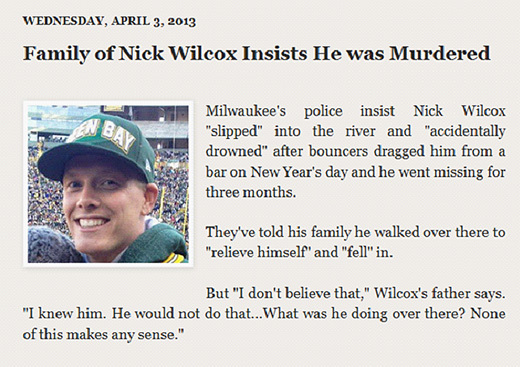 On March 28, 2013, almost three months to the day after Irish Rec’s security team manhandled him into the streets where he promptly and “mysteriously” vanished, a pair of patrolmen spotted Wilcox’s body floating in the Milwaukee River. Because statistically improbable water fatalities like his had been happening in Wisconsin for two straight decades, Team Wilcox was wisely scouring that same waterfront area for weeks and weeks without end. And yet they didn’t find their missing young man in the river or along its banks. The officers who did “stumble upon” his waterlogged remains there in the dark of night claimed they had managed to do so just by chance. Anyone with information about his staged drowning is urged to call the Milwaukee police at (414) 933-4444, or their Sensitive Crimes Division at (414) 935-7403. There is no statute of limitation on murder.